This subject is a bit of a minefield and I’m happy to take comments from both sides of the school gate community…but the big question we all ask ourselves when we have our first baby is whether to ‘go back to work’ and if so when? I’m sorry but his attitude, which was well meant I dare say, was like a red rag to a bull. We nearly doubled turnover both the years my children were born AND I loved them to bits. They were and still are the most precious things in my life. But my ambition was not thwarted. I’m very, very lucky. I own the company and I have always been able to work the times and hours to suit – juggling day and night to make sure I have plenty of time with my boys and still manage to work as a full time MD. But it’s not for everyone, and you may need to work 16 hours a day with absolutely no ‘me time’. I do feel guilty all the time! I just accept the feeling of guilt and do my best to keep everyone happy – which sometimes works and sometimes it doesn’t. Daisy Waugh wants to fight the guilt. She thinks it’s society that inflicts it upon us. I don’t agree with all her views although she is one of my best friends, and since the age of 15, we have had long, heated discussions about everything possible from politics to food to child care. I love home baking birthday cakes for my kids and working on their art projects. I also prefer to give up time with adults to be with them most of the time – possibly too often even! But so does she, even if this is not always apparent in her book. We often plan to meet for a drink after work, but somehow or other we cancel on each other time and time again because the reality is we both want to just hang out with the kids after work. 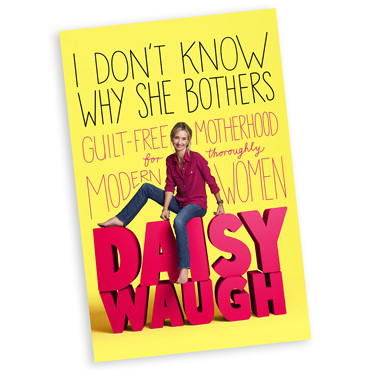 Her book, I Don’t Know Why She Bothers, is wonderfully liberating but as I have said in the description on our website – it’s possibly a little too much for the first time mums who are enjoying being great stay-at-home parents and will not relate to Daisy’s laissez-faire attitude. The one thing I will categorically stand up to and champion is that Daisy is a fantastic mum in every way and her children adore her. We have had dozens of very happy holidays together with our brood and I’d say she is pretty well rounded in her passion for keeping her little ones happy. It’s a great read, ideal for beaches and will definitely ring true to all seasoned parents, but possibly not the right book for the labour ward if this is your first one! To buy Daisy’s book please pop into one of our London stores, Kingston or Guildford or for free mail order click here. ← JEYNES JOURNEYS: Come to us! Totally agree with you, I set up my business just after giving birth to my first daughter. Rather than losing ambition, having a child spurred me on to be the best person I could be for her sake, and that meant becoming self employed so that I could fit my working day around her. I haven’t read this book yet but I definitely think I’ll give it a whirl!